Few places in Australia offer such a diversity of pristine scenery and hiking options as the Victorian Alps. This inn-to-inn walk traverses striking landscapes of alpine forests, grassland, snow-blanketed mountains, precipitous ridges and high plains. The alpine hiking trails cover some of the most spectacular sections of the 700km Alpine Walking Track from Walhalla to Canberra. With each breath of fresh alpine air, the stresses of modern life will slowly be left behind. Take in dramatic views from the breathtaking Razorback Ridge to Mt Feathertop, the second highest peak in Victoria. The undulating ridge walk is complemented beautifully by the decent through stunning Mountain Ash forest to Harrietville. The walk from Hotham to Falls Creek via the Cobungra Valley, Derrick Hut and Dibbins Hut is not only epic but provides a real sense of accomplishment. The Great Alpine walk is an epic immersive mountain experience where you will be supported by our team on the ground all the way. At the end of each day you’ll have the luxury of having a hot shower, a chef prepared dinner and breakfast and a good night’s sleep in a comfortable bed, rising refreshed and primed for each day. Importantly, there are additional short walks in the area for those who need more exercise. Note: We highly recommend taking a rest day at Dinner Plain. Start in Bright any time after 2pm. There’s no walking scheduled for today, however there is a nice walk along the Ovens River that passes through the middle of town. If you arrive early enough you’ll also have time to explore the small township of Bright. After a transfer high into the mountains, the walk begins by following an easy Aqueduct Trail connected to one of Australia’s early hydro-electricity schemes, built between the 1930s and 50s. Mountain cattlemen’s huts feature prominently on this holiday and today you’ll visit the oldest in Victoria – Wallace’s Hut. The ancient snow gum trees here are twisted and gnarled by centuries of harsh winters. After rain or fog, these tree trunks change colour to brilliant shades of red, orange, yellow and green. After lunch, walk along the southern edge of Rocky Valley Dam, before climbing to Falls Creek ski resort. An easier walking day, following more alpine hiking trails along an aqueduct track and crossing gently graded snow plains. All the walking terrain yesterday and today provides superb cross-country skiing during winter. The day ends with a trek to the summit of a small peak with a fine view over Falls Creek and the Kiewa Valley before strolling along another aqueduct trail back to the village. 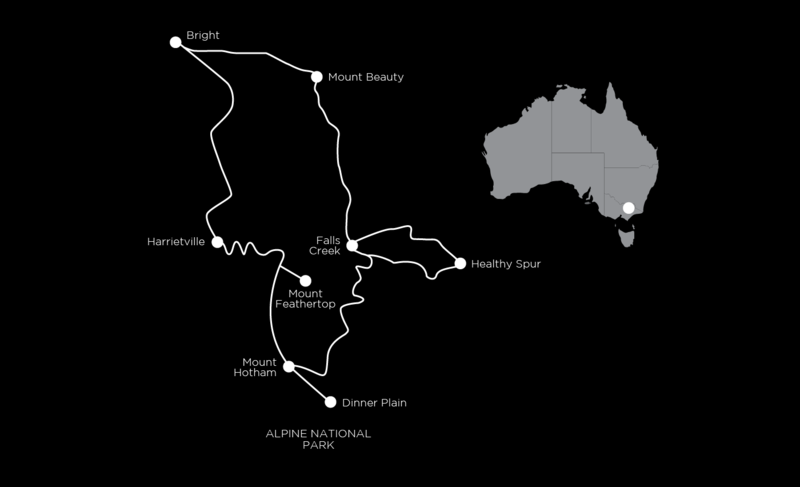 Follow a section of the Alpine Walking Track (750 km between Walhalla and Canberra) all the way to Mt Hotham. Very few people have done this bushwalk, even amongst the locals. You certainly won’t see many people out here, in fact, you are more likely to see brumbies, Australia’s iconic wild horses. Along the way, drop steeply down to the Cobungra River and Dibbins Hut (sometimes also called Creep-Inn – you’ll see why), then back through the Mt Hotham alpine ski village. Skiers flock to Hotham for its powder snow. It is easy to see how the surrounding steep valleys would provide protection from strong winter winds, allowing snow to settle gently into deep drifts. Today’s alpine hiking trail meanders through snow gum forests and across thick snowgrass plains, with many spring wildflowers. The standard 10 km track to Dinner Plain is easy, but you can also add an optional 9 km return walk to the aptly named Mt Tabletop. Cattle grazed these plains until recently, and you’ll see historic huts and even some cattle yards made by felling trees into piles. You’ll walk into Dinner Plain, the highest freehold land in Australia, where every building is constructed of mud brick, weathered timber, local rock and galvanized iron. You can build anything you like there, so long as it resembles a cattleman’s hut. Many of our walkers have suggested that you take a rest day at Dinner Plain. This allows you to recover from a couple of big walking days. There are short walks close to the village. We can arrange an extra night for you. After an early start, you’ll be transferred to the breathtaking Razorback Ridge, surely one of the most dramatic walking routes in Australia. As you walk along it, Mt Feathertop gradually looms more and more impressively. The final optional steep climb to the summit is wonderful. The rest of the day is spent walking down the gently graded Bungalow spur, covered by tall and most impressive mountain ash trees, to the township of Harrietville. The town was built on mine tailings created by a huge dredge called the Tronah Monster, which was sold to a tin miner in Malaysia in the 1930s. Today it’s a friendly holiday village with a laid-back atmosphere. The trip ends after breakfast when you will be transferred back to Bright to either your vehicle or public transport connections. The alpine hiking trails are reasonably well graded and mostly easy to negotiate. Full day walks average about 15km with some ups and downs but with relative flat sections across the alpine plain. There are great opportunities for fit walkers to challenge themselves on least two of the days where we walk over 18km. The accommodations are excellent on this the Great Alpine Walk, with quality ski Lodges, hotels and bed and breakfasts all in excellent locations. More importantly, the hosts have been part of our partner network for 20 years or more and offer a level of unsurpassed friendly service that you can only find in the mountains. Private rooms at Bright, Harreitville, Dinner Plain and the Ski Lodge at Falls Creek and Hotham Alpine Village come with their own ensuites. The two course dinners are prepared by chefs and your host on one night, as are the cooked breakfasts. This Great Alpine Walk starts and finishes in Bright. It’s a 5-hour drive from Melbourne, with public transport services available from the city. Contact us for more details. This is one of the more challenging inn-to-inn walks. The terrain on the alpine hiking trails is sometimes undulating, some up and down, but with a great deal of flat sections along well-marked trails. Rougher tracks progress along gradual ascents to the summits for spectacular views, then down steeper downhill sections through snow gums to forested valleys below. You’ll be walking an average 17 km a day over five days. Those that enjoy the solitude of nature will appreciate some days where you are probably more likely to see deer and wild horses than other people. There are five walking days on this seven day itinerary, starting in Bright and ending in the village of Harrietville. We include accommodation from day one to day six, plus most meals, transfers and comprehensive trip notes and walking maps. Each day we transfer your luggage to the next accommodation so you can focus on enjoying the walking with just your daypack and what you need for the day. Not included is the alcohol, meals not listed in itinerary, drinks with meals (except tea/coffee and juice with breakfast). If you have any questions about the Great Alpine Walk, feel free to ask one of our destination consultants. You can get in touch with us via our contact form, email us at info@auswalk.com.au, or call us on +61 3 9597 9767.